Oh man. I hurt. But I feel so happy that I wanted to share it. Do you ever get an idea for a project (OK non card project), and once your decide to put that project in motion you CAN’T wait? Maybe its my OCD? I always make “lists” of things to do, and cross off as I go. I get a thrill everytime something is accomplished. Well “I” got the bright idea to re-do the kids rooms Sunday afternoon. Just sitting there looking at all their CRAP! So we went and bought what I thought was needed. UGH!! WHAT WAS I THINKING? I felt the rooms needed a make-over, a face lift of sorts. Also it wastime for my quarterly room review! This is when I got through all their toys and weed out what we don’t need, won’t use, and have wrecked or outgrown. Since getting this “idea”, I was told by Jay we would execute it this weekend. Together we we purge, organize, paint, move furniture scrub every little thing owned. Girls room first-repaint, new bedding, curtains decor-you get the idea. Amber needs a big girl bed-she is in a toddler bed now. Well I woke up, had a good cup of coffee, and instead of stamping “I” spent the ENTIRE day puring, organizing, moving furniture, washing everything-walls, windows blinds nick-knacks you name it, and YES! Painted the entire room myself-all done and put back together, before Jay even got home! The room looks so clean-and sweet. Once I finish the last details it will be perfect. Their room is now a pretty SOFT yellow, with like a Pink Passion and touch of orchid opulence! Its a girly room-with alot less clutter, and their Princess and other girly things look great! This weekend we will get Amber’s bed and a new rug. I also want to get 2 plastic picket fence panels to use as their headboards-then hang a flower garland across them. Then-onto Noahs room! I am tempted to do his tomorrow-BUT I need to go to Target first to get his room decor stuff. Despite the pain, I feel SO much better now that most of the work is over! OK Sorry to ramble-I just had to let out a huge sigh and relish in my accomplishment of the day. I also got the houser cleaned and dinner made-now THAT is a true miracle. Tomorrow is definitely Pizza night! Oh yeah and totally a stamp day-all three have school! YEAH!!!! Well thanks for reading-if you did! LOL! Well I hope you are up for a little challenge!!! This should slap you out of “no mojo” mode if you feel like you are in a bit of a rut. We all have patterned paper-probably tons more than we could ever use in a lifetime-yet we always buy more! LOL! OR you could totally make your own patterned paper (wow! remember those days? LOL!) for this as well. Some pattern’s become your most favorite, and cherished. Other’s not so much. Either way there is a great use for all those scraps. I always like to find new ways to highlight or use my things. I also like to pack a lot of “punch” (no pun intended) with a clean and simple-yet finely detailed card. I was messing around the other night with this idea, and executed 3 looks. I hope YOU will try this out, since it is a ton of fun! You need to create an open space-be it with punches, or using a hobby blade/paper snips to cut out part of an image, and layer behind it with patterned paper! Be sure you use dimensionals to get that LOOK! Its very important. See my samples below-or think: instead of paper piecing the object-cut it out, and layer the paper behind it. I made this for a friend who is going through a difficult time right now, and I think this message will help her. 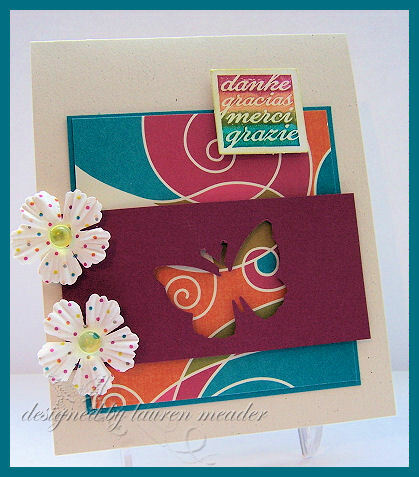 This card was done using-Beautiful Blooms, Butterfly Kisses, and Everyday Blessings. I stamped the leaves in the corner using Spring Moss ink-then used some various paper punches for my flower’s. After they were punched, I layered Everyday Blessings paper underneath, using dimensionals! Added some pearls to the centers. REALLY PRETTY in person. 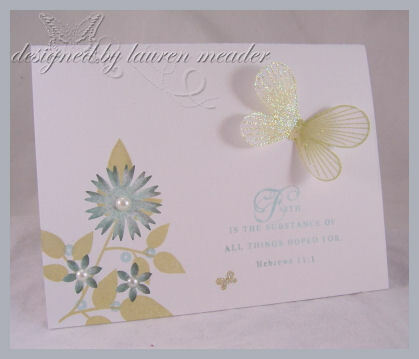 The butterfly was done using Craft ink-on vellum card-stock-then embossed with iridescent ice EP. Its just gorgeous floating there! I then realized I wasn’t sure I LOVED the flowers-I liked them-didn’t LOVE them. SO I amde another! Now this one is a little different-ALL the smae elements-stamps ink and technique, just the flowers are more round, like one of the flowers in the set, and I used the dotted image for the butterfly wings. The butterfly is also “floating”-and shimmery-the photo just didn’t pick it up! Poor lighting today. Sorry-too lazy to get my photo set up out. I just really LOVE this card. I just got this paper from Verve Visual-which I believe was discontinued my them. Anyway-I liked the colors and pattern, and thought it would be PERFECT, for my UBER cool, big butterfly punch by EK Success. AND it was! I was thrown off by NOT using WHITE-but natural ivory. I used the colors in the paper, and colored my sentiment from the Thank You set by Green Grass, using markers by SU! You can never have too many thank-you cards. The flowers are Prima Got Prints, and match perfectly too. It was a card that came together very quickly. So that is it! I hope you enjoyed today’s post. If you have time try it out. Send us all a link here so we can check in on you and see how it turned out. I’d love to hear what you think of it.